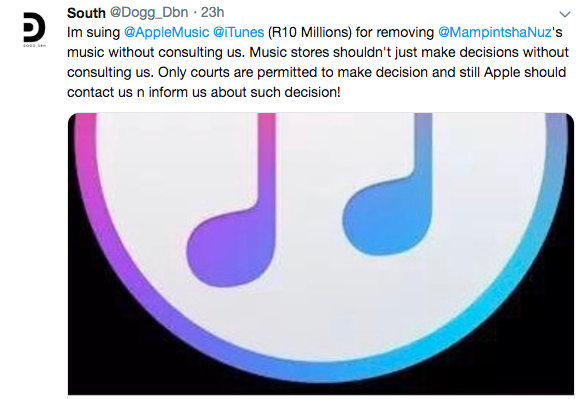 Durban-based event organiser and artist manager Dogg DBN aka Lindo Buthelezi has come out guns blazing at the recent banning of Mampintsha's music from iTunes music store. Mr Buthelezi confirmed in a tweet of his that they plan on suing the online music streaming platform for R10 million, yikes! Buthelezi lamented by mentioning that iTunes charges artists for placing their music on the platform & that not consulting the artist and their team before banning the songs is a breach of contract. The artist manager further mentioned that such a move from iTunes is a blessing in disguise as it's teaching black people the importance of ownership instead of being consumers. Buthelezi has even gone to the extent of cautioning radio personalities who have publicly mentioned that they would be banning Mampintsha's music from their show's playlist without consulting their station managers. One of the few radio personalities he has confronted is MC Bonde from G98.7 FM after the radio jock expressed on social media that he would be banning Mampintsha's music from his show. Buthelezi advised MC Bonde not to do so as he would work hard at ensuring that he got fired from his job for such an act without consulting his managers about this ban. In other news, Buthelezi also confirmed to Tshisa Live recently that he is assisting Mampintsha to execute his #FixItFixHim organization aimed to assist men to deal with their personal issues which could potentially lead to abusive behaviour.